I just wanted to say Happy Holidays to everyone, and thank you all for visiting my blog and FaceBook page, and for leaving such wonderful comments throughout the year. I hope everyone has a great holiday season, and a terrific 2012. I've really been out of the loop for quite a while now. With the Thanksgiving holiday, and family in from out of town, my attention was diverted from my career. Which was a good thing, because Karen and I really needed to get out of the "work all of the time mode", and chill a little bit. My brother Doug was here from New York, and he convinced us to get a Christmas tree this year. We don't have much space in our house, so we usually just decorate the mantle of our fireplace, but with some creative rearrangement of our furniture it worked perfectly. We had a great time decorating the tree, and it looks great. Thanks bro! 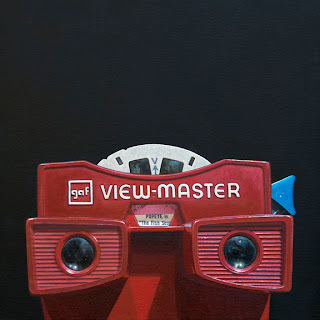 With the first round of holidays over, I've been working on some new stuff, the first of which is this GAF View-Master. 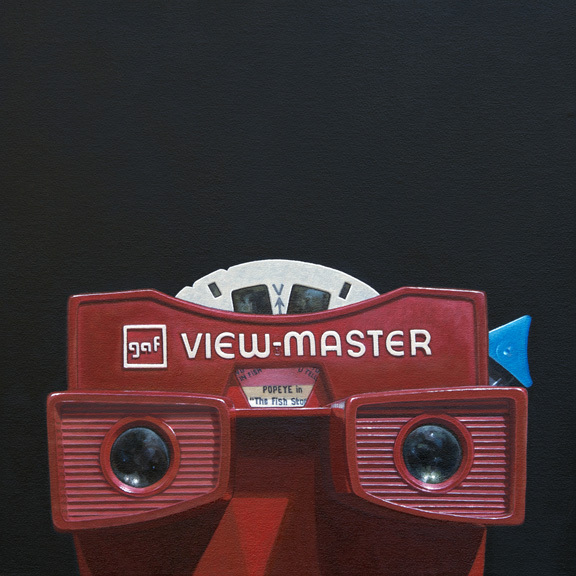 These devices used to blow my mind when I was a kid, and I thought it would be fun to paint one. Now I'm deciding on the dimensions of my next piece. I'm thinking of going overscale with it, but haven't made up my mind just yet. I think it could look really cool big. I hoping to make a decision today. I've had some good sales in the last few weeks. I shipped two paintings to Tree's Place Gallery which were marked for the Boston International Fine Art Show. 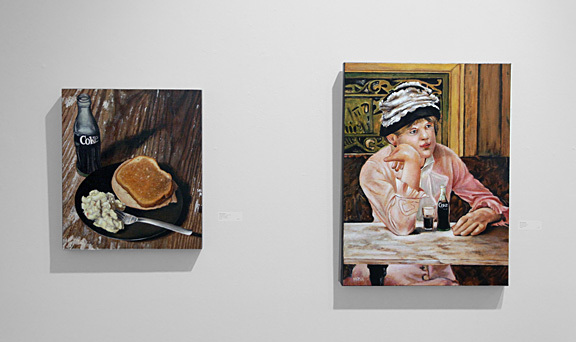 One sold as it was being unpacked at the gallery, and the second sold at the show. Mason Murer Fine Art sold two of my large paintings. 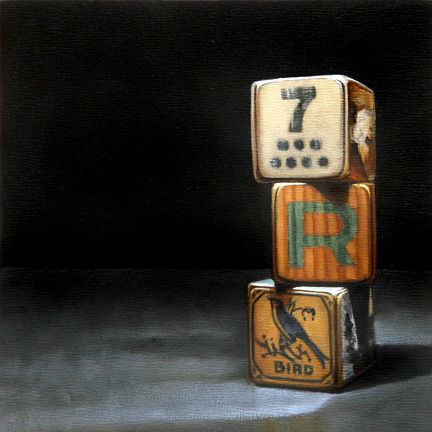 Mule No.2 sold a couple of weeks ago, and they sold my B-25 at the Miami Red Dot Art Fair over the weekend. Karen should have a nice Christmas this year. Speaking of gifts, I'm thinking of asking Karen for a new ball head for my tripod for Christmas. If there are any photographers out their with a favorite model or brand, I'd appreciate your suggestions/testimonials. 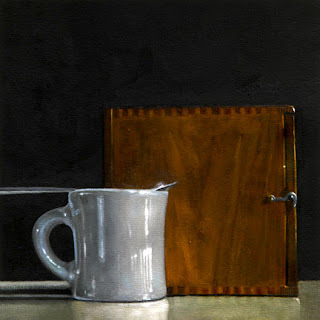 The final painting of the week is a mug, and wooden box. The box contains a small microscope given to me by my brother. I love the finger joints, and the little latch which holds the door. 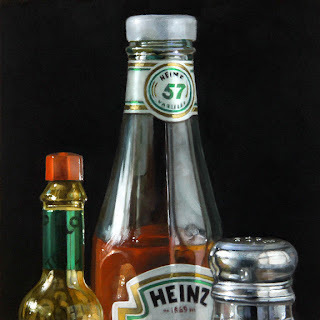 If you'd like to bid on this painting you can take part in the auction by clicking here. One of my new acquisitions from ebay. 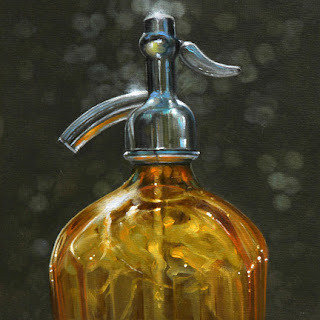 A seltzer bottle made of an exquisite amber colored glass. It's really cool. If you'd like to participate in the bidding, you can access the auction by clicking here. 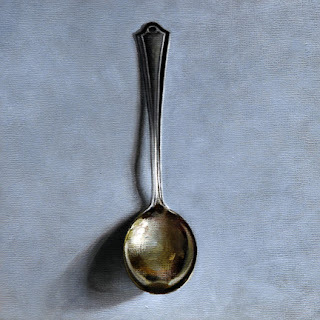 My third painting for auction this week is a single tarnished spoon. I thought it looked really good just on its' own. If you'd like to bid on this painting, you can access the auction by clicking here. Spent most of the day back in my old workshop (the garage) using my woodworking tools once more. It wasn't to create a piece of furniture, but rather to build a big wooden crate to ship a large commissioned painting of Karen's to Australia. I spent a ridiculous amount of time on it, but it was really fun to cut some wood again. Tonight's ebay offering is a new pb&j. If you'd like to participate in the auction, click here. I've been out of the loop for quite a while now. I had been doing some new photography, with moderate success. I'll be doing more in the near future. Karen and I also took a few days off, and went up to Hilton Head Island to spend some time with Karin Jurick, her boyfriend Brett, and their two new puppies Zac and Joey. They had rented an amazing house, thirty feet from the beach to stay in while Karin taught one of her wildly successful workshops. We all had a great time together. It was nice to get away, and not think about painting for a little while. As soon as we returned to Atlanta, I got busy working on five new paintings to be auctioned on ebay. 7RBird is the first. If you'd like to bid on this painting, you can access the auction by clicking here. This past Saturday evening we attended the opening night reception for Karen's group show at the 16 Patton Gallery in Asheville, NC. 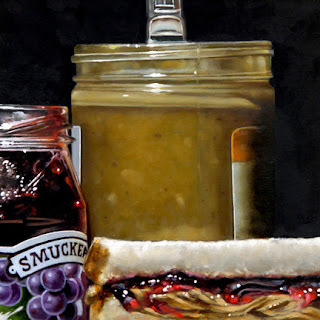 Her work was presented along with that of Karin Jurick and Suzy Schultz. We headed up mid-morning which, entirely by chance, coincided with the departure of Karin Jurick, and we wound up playing an impromptu game of tag as we passed each other periodically on the drive up. The weather was absolutely perfect that day, and the city was saturated with tourists. We were all staying in the Haywood Park Hotel in the center of town, and arrived there simultaneously. Our room wasn't quite ready, so we dumped our bags in Karin's room, and headed out to find a place for lunch. Our first two choices had long waits, which was fortuitous because we discovered a wonderful mediterranean restaurant called Jerusalem Garden Cafe. We lingered there as long as we could, but the show was to begin at 5 pm, and we needed to return to the hotel and prepare for the show. Receptions usually take a little while to heat up, and there were only a few visitors present when we arrived. One of the first people to walk in was Douglas Hoover, an artist and graphic designer from North Carolina. Doug was a really nice guy, and we all had great time talking with him. As the evening progressed the gallery began to fill, and soon it was buzzing. Suzy was in Los Angeles, but the two Kare(i)n's were busy most of the night discussing their work with enthusiastic patrons, while I recorded the event on film. Early the next morning we shared a wonderful breakfast with Karin at Restaurant Solace, then packed up and headed back to Atlanta. The weather was great, the mountains were beautiful and we had a collection of Richard Matheson short stories playing on the iPod. It made for a delightful ride home. Not too long ago there was a British Car Show in town, and I went to check it out. 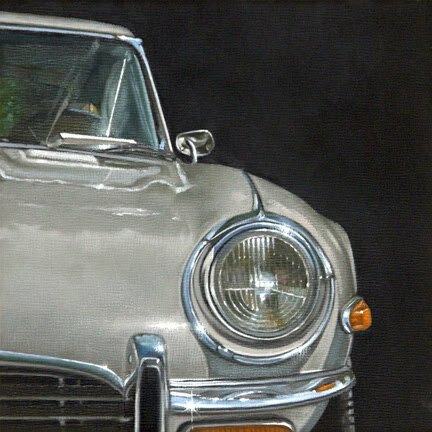 My first car was a MGB-GT, so I have a soft spot in my heart for British sports cars. It was a really good show, and I got a lot of photos. A bunch of candid shots and potential painting reference material. I'd like to use some of that photography one day for a large painting, but for now I'll indulge myself with a small one. 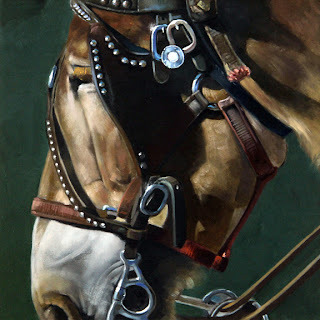 If you'd like to bid on this painting, you can participate in the auction by clicking here. 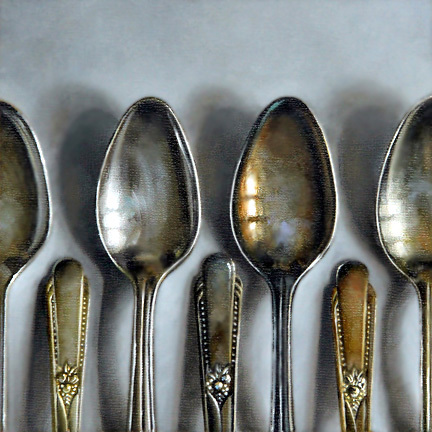 I just can't seem to get enough of this old tarnished silverware, but it may be time to add in some knives and forks. If you'd like to bid on this painting, you can participate in the auction by clicking here. A couple of years ago the Center for Puppetry Arts here in Atlanta had a special exhibit of Gumby related artifacts. It was a really good show. The gift shop, not surprisingly, had a multitude of Gumby items for sale, and I bought this mug before we left. 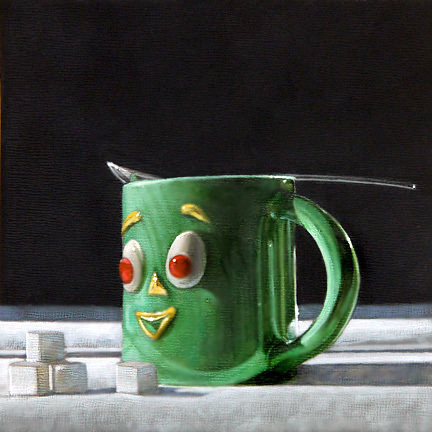 It's a great little mug, and thought that maybe I should do a painting of it to go along with all the other mugs done over the years. You can access the auction for this painting by clicking here. 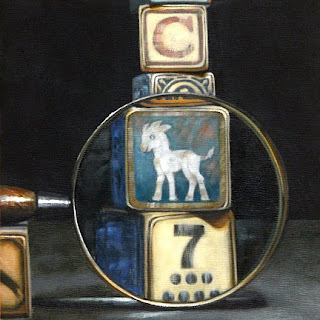 Some childrens' blocks enlarged with a magnifying glass. To bid on this piece click here. On a recent trip to Charleston Karen and I were walking around the town when we came upon this open doorway. I couldn't resist stepping inside to get a shot. The entryway was showing its' age, but that terrific door, and the weathered wainscoting were inspiring. If you'd like to bid on this painting, you can access the auction by clicking here. You made my life more productive, and much more fun. Thank you. I was recently contacted by Michael K. Corbin to do an interview for his website ArtBookGuy. Michael is a writer specializing in books about art. In his own words, "Ultimately, ArtBookGuy is a brand ... a campaign and movement backed by my slogan, "Art For All People." 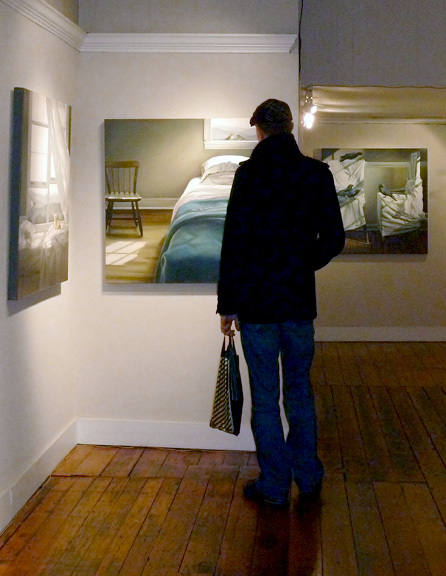 Spreading art appreciation by turning folks on to emerging artists. No fear or snobbery. It teaches that art has unique power to unite us and change lives and the world. Human". Michael is a great guy, and we had a good time discussing . . . me. So, if you have any interest in what I may have to say about my own paintings you can read the interview here. Karen was interviewed a few weeks earlier by Michael, and you can read her interview here. I've got a few more paintings ready for the ebay auction block, and I'll begin listing them next Monday. As those auctions run in the background, I'll be doing some photography. I've picked up some new items as subject matter for paintings, and I'm excited to see how they are going to work. Another nostalgic offering this week is this old Hamilton Beach milkshake mixer. To participate in the auction click here. 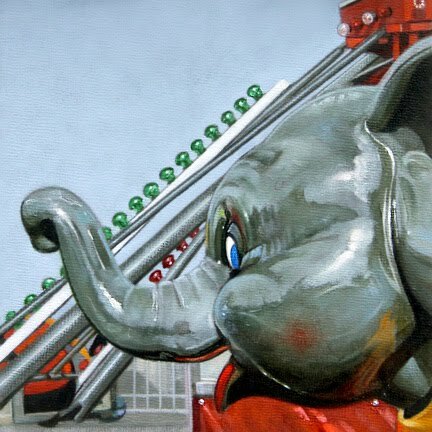 This carnival ride is such a treat to paint. First off it has that terrific shiny surface, and secondly it has that wonderful happy face. I'm already looking forward to painting it again in the future. To participate in the auction click here. Four tarnished silver spoons. Nuff said. To participate in the auction click here. There's something about glass, and the color red. They really go well together. To participate in the auction click here. I'm back on ebay this week with five new paintings. 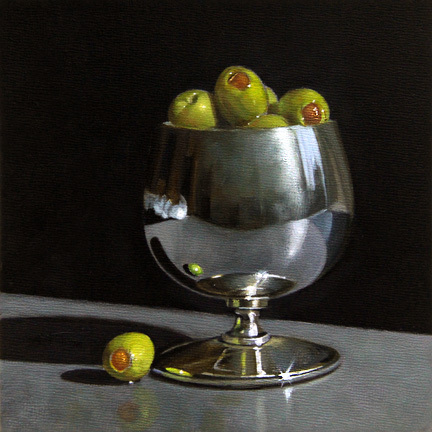 I used to paint this little silver goblet a lot, but got away from it for a while, so I thought I'd bring it back. I don't know how the olives wound up there, but they really work. If you'd like to bid on this piece, you can access the auction by clicking here. The (first) opening for the Coca Cola show was on Friday night. 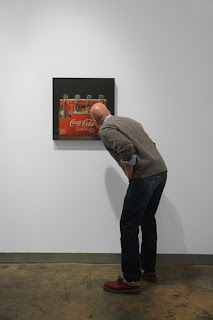 Mason Murer Fine Art organized the show for a meeting of Coca Cola's top 200 shareholders to be held later in October, but incorporated the Coke paintings into a larger show entitled Real Things which fills the bulk of the gallery. 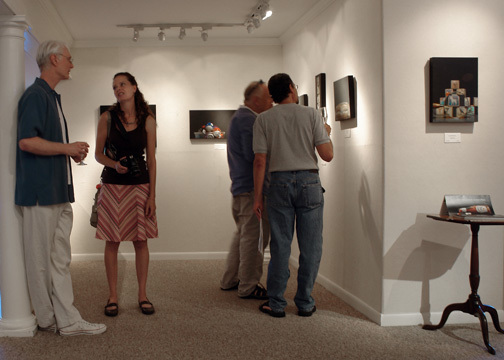 Gathered around Teresa Fischer's work. 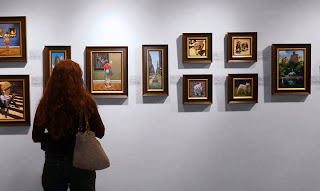 The exhibition was particularly exciting for me because I was able to suggest a number of names to the gallery owner for inclusion in the show, and nearly all of them were able to contribute paintings. My intent wasn't completely altruistic, because I knew it would give me an opportunity to see, in person, the paintings of artists I admire. It's great viewing art on the internet, but it doesn't compare to seeing it in the flesh. 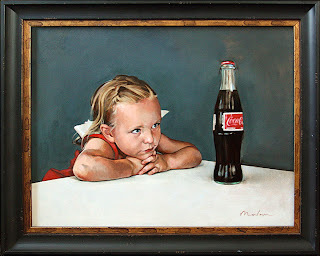 I don't mean to play favorites, because truly all of the paintings were wonderful, but I have to say that the painting Coca Cola by illustrator/artist David Malan was my pick for best of show. I've been a huge fan of his for years, and it was a real treat to finally see one of his pieces up close. Another artist I've admired for a long time, and one who was able to make it to the opening, is Otto Lange. His crushed Coke can was spectacular. It was really nice to have the chance to meet him, and talk shop for a good part of the evening. I have to say I've been very lucky in the last couple of months to have the opportunity to meet two of my favorite artists. 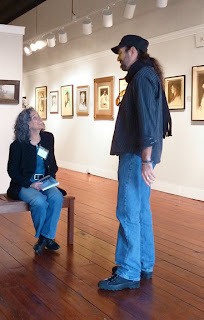 First I meet Teresa Fischer (who has two paintings in the Coke show) in Cape Cod, and now Otto. 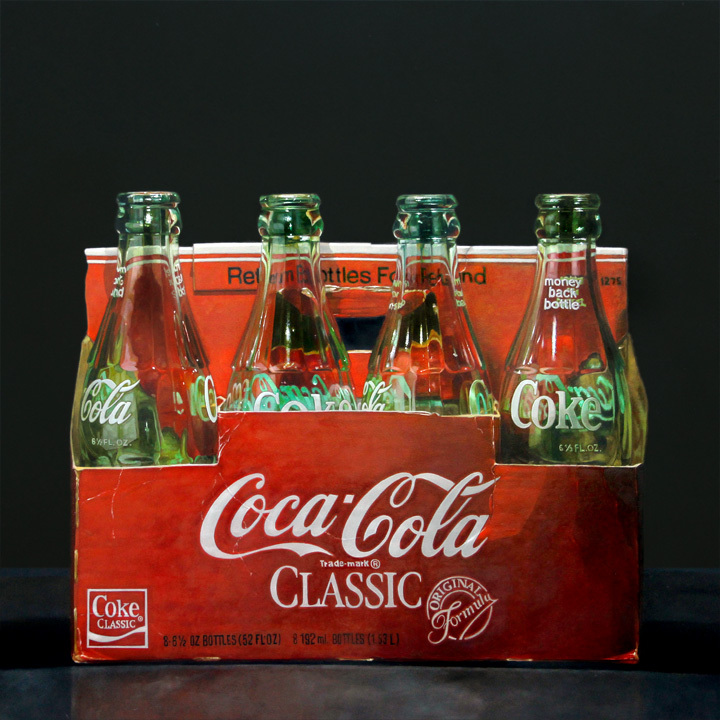 Other artist/colleague's, with an internet presence, that took part in the Coke show are: Alvin Richard, Vic Vicini, Chris Stott, Todd Ford, Sally Tharp and Jelaine Faunce. 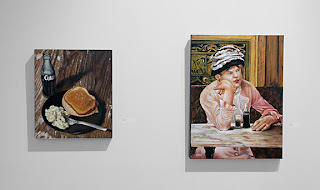 And last, but not least, two terrific paintings by one of my oldest, and best friends Mike Kasper. Mike is one of those people who seem to be able to do just about anything. 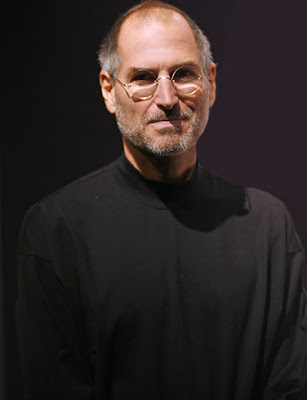 A short list of titles I could apply to him would be; artist, sculptor, woodworker, engineer, welder, graphic designer . . . I can't believe it's almost been a year, but it's time again for the Elliot Fouts Gallery Realism Invitational in Sacramento. 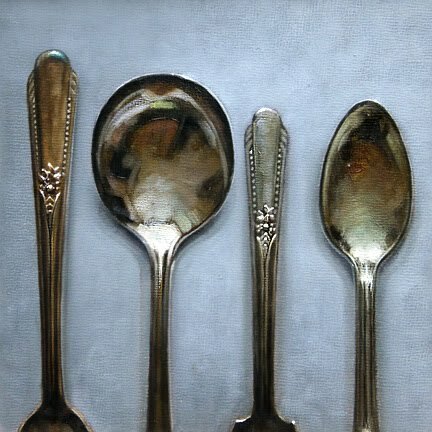 My plan, when I was first approached, was to do multiple paintings, but time got away from me, and I was only able to complete one. But . . . I think it's a good one. 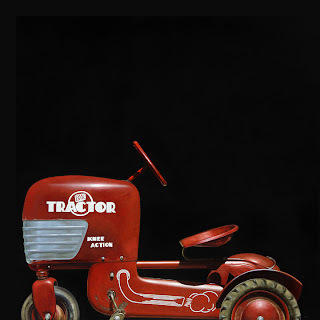 I found this 1950's riding toy tractor at a local antiques store that allows me to rent items. It was sitting out in front of the shop, and I knew I had to paint it. That fantastic red, and those graphics were too much to resist. On a canvas size of 36 inches I think it is nearing 1:1 scale, close to life size. 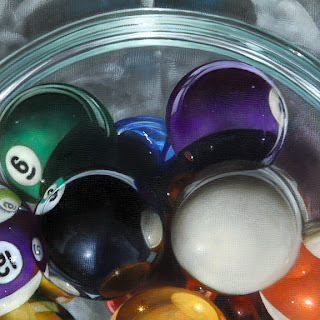 There are a whole bunch of great realist painters represented this year, so if you're in the Sacramento area the evening of October 8th you should stop by and check out the show. I've been busy working on a commission these last couple of weeks, and it's finally finished. I've received more comments on a painting I did years ago called Pitcher with Ice than anything else I've ever done, and the client who commissioned this piece said they wanted something very similar to it. I've emailed them the image of the completed painting, and they are very happy. 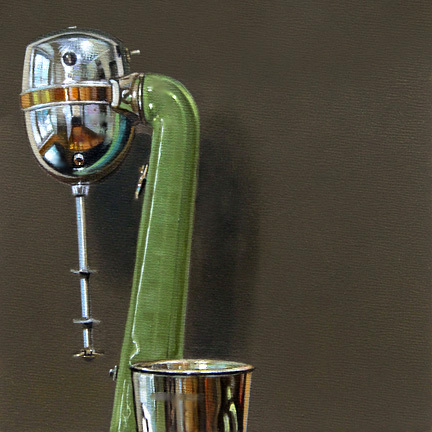 Whew, it's always a relief to hear that a client is happy with their painting. These Clementines on the other hand met another fate. The winner of the auction decided they didn't want the painting after all, so I'm re-listing it once more on ebay. If you'd like to bid, you can access the auction by clicking here. And finally, I'm working frantically to complete a larger painting (36 x 36) for a group show put on by the Elliot Fouts Gallery in Sacramento. 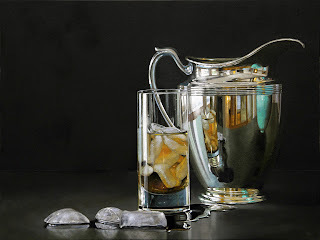 It's an invitational realism show scheduled to open October 1st. They've got a long list of terrific realist painters participating, and I'm proud to be included with them. The only problem is that I have to get them the painting by the 23rd of September. Yikes! Back to work. This is a shout out to help our good friend Carol Marine. Carol, her husband David and their son lost their home on Sunday when a fire swept through their subdivision near Bastrop Texas. According to reports, nearly 300 homes were destroyed. The good news is that they are safe. Jennifer, a close family friend, has organized a fund to assist them immediately. Please click here for details, and give what you can to help Carol, and her family get back on their feet. 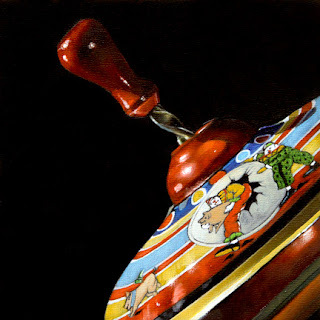 To finish off the week, my vintage Spinning Top. I first painted this toy for a corporate commission I did some years ago, and I think it's a great subject. The colors, shape and illustrated surface, it's just too cool. I love painting this thing. If you'd like to take part in the auction click here. 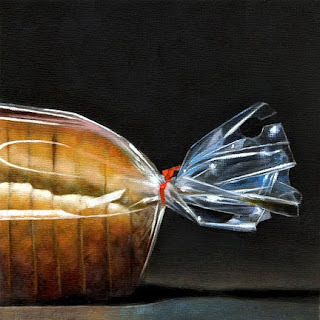 Tonight it's the front end of a loaf of bread, wrapped in a cellophane bag. I love how many colors you can find in a simple loaf of white bread. If you'd like to bid on this painting, you can access the auction by clicking here. 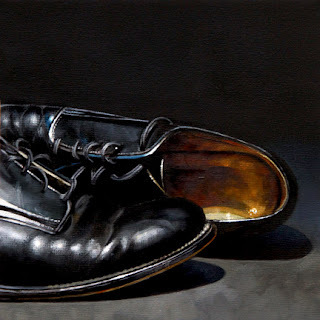 I've used these shoes as the subject in a number of paintings. They're my only dress shoes. I was issued these in 1972 on my first day of basic training, and they've been my wedding, funeral and job interview shoes ever since. You can surmise from this that I'm not a slave to fashion. I love their, "been around the block look", and that tan interior is terrific. If you'd like a painting of my shoes, you can bid on it by clicking here. 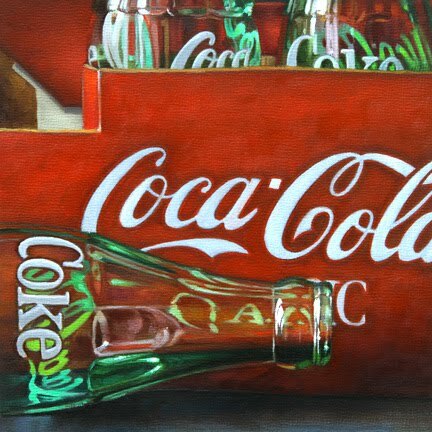 When I finished up the Coke painting, I still had a bunch of "Coke" colors left on my palette, so I thought I'd take advantage of them, and do a small Coca Cola painting for auction on ebay. If you'd like to bid on this piece you can access the auction by clicking here. 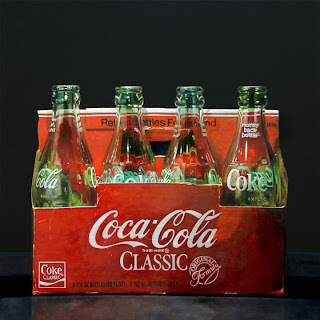 After I completed the Coke carton for Mason Murer Fine Art, I decided to do another five small paintings for ebay before I got to work on a much larger painting I'm planning to send to the Elliot Fouts Gallery for his October group show. 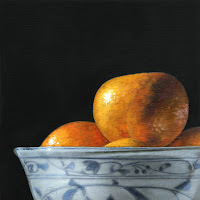 Up first this week is a ceramic bowl filled with Clementines. If you'd like to participate in the bidding you can access my auction by clicking here. Well, I've spent two solid weeks working on this painting, but I think it's finally done. I find myself wanting to hang onto it a little longer, but I don't think I can get much more out of it. 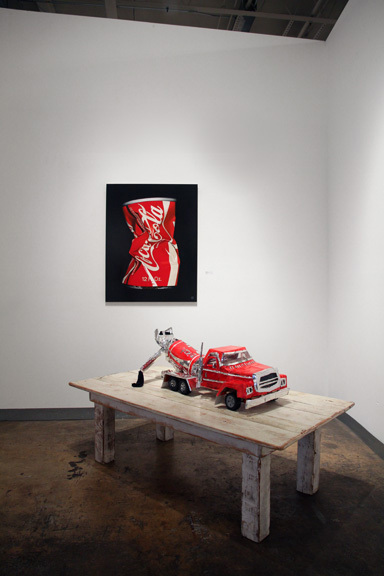 Mark Karelson at Mason Murer Fine Art is hosting an "event" for some of the top brass at Coca Cola in October, and invited a number of artists to fill his space with Coke related art. I painted a "half" version of this composition a while back for Stricoff Fine Art, and always wanted to revisit it so I could take full advantage of all that type on the carton. I thought this show would be a good opportunity to try it again. There are a couple of other group shows this fall I want to participate in as well, so this may be my only contribution to the Coke show. If I can get those other projects done quickly, I'll try and squeeze in another piece. I'm really looking forward to seeing what all the other artists come up with. I think it's going to be a great show. 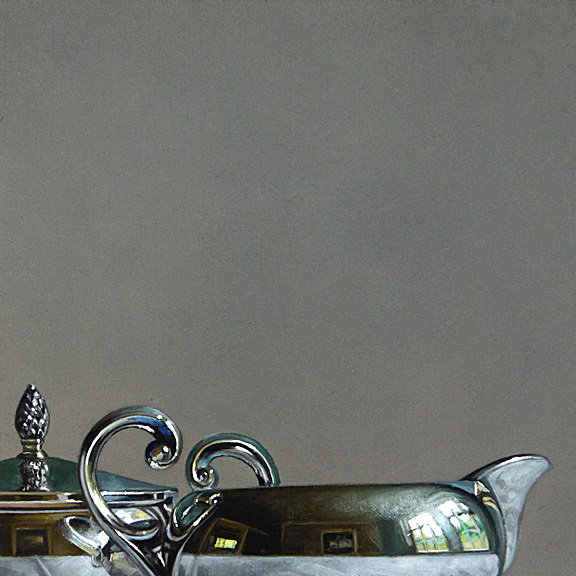 The final painting going up for auction this week is a little silver piece. Karen and I inherited a silver set from her parents when they were cleaning house. They thought we'd like it, and I do. 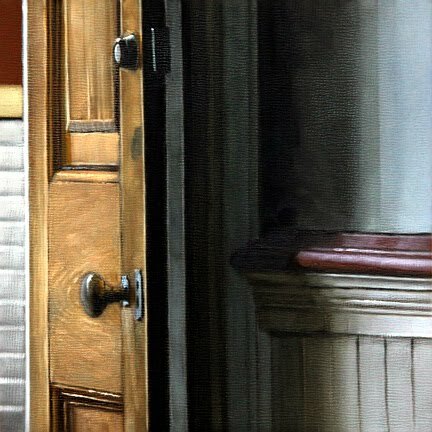 I've done quite a few paintings from the set. This is a sugar bowl and creamer. I know it's corny, but I kind of liked how the two handles created a heart when placed back to back. If you'd like to bid on this painting, you can access the auction by clicking here. 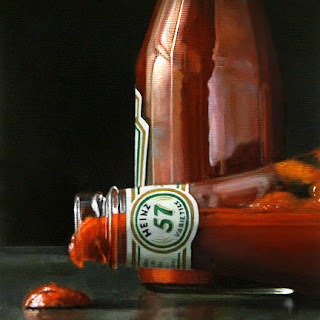 I was pondering the idea of doing another "Condiments" painting, so I did this little study at 5.5 x 5.5. This is only the top portion of the final composition, but I thought it worked pretty well on its' own. The full version will provide an opportunity to paint all the labeling. If you'd like to bid on this painting, click here. I've been thinking of painting another Mule, so I did a small "study" of the head to get into the groove. I'm not sure if I'll do the mule's entire body, or just its' head. I'll just have to wait and see how I feel when the time comes. If you'd like to bid on this painting, click here. 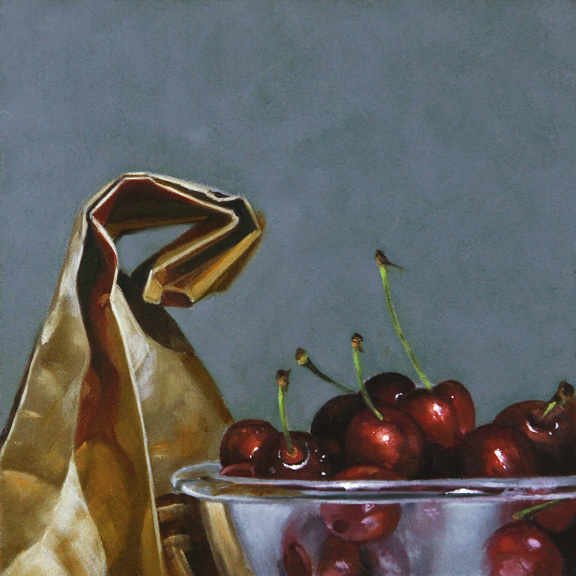 Tonight's it's a bowl of cherries, and the bag they came in on. If you'd like to bid on this painting click here. I'm currently working on paintings for a number of group shows coming up in the fall, but I thought before I really got rolling on those I'd put up some 6 x 6's for auction on ebay. It's been a long times since my last ebay listing, and I've been really missing the auction experience. I'll be posting five new paintings this week, one each night at 9 pm. Tonight's listing is my 21st Pool Bowl piece. I never tire of painting these colorful spheres. If you'd like to bid on this painting click here. Karen and I returned from out trip to New England yesterday afternoon, and I have to say it was a wonderful four days. 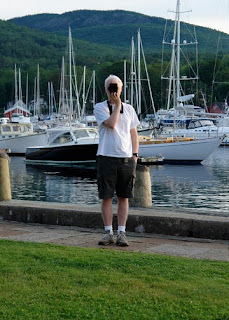 We caught our plane early Thursday morning to Boston, where we rented a car, and headed up to Camden Maine. I've wanted to visit the Olson House in Cushing for years, and this seemed to be a perfect time to fulfill that dream. My mother introduced me to the paintings of Andrew Wyeth when I was young, but I became a full fledged fan when I attended an exhibition of his work at the de Young Museum in San Francisco in 1973 while I was stationed at Travis Air Force Base. I went back to see that show multiple times before it moved on. 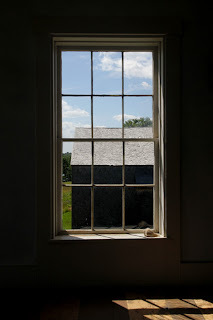 Having spent so much of my life admiring the paintings he had done at the Olson House, I had to take advantage of being this close, and include a visit the location. My first reaction, as the house came into view, was visceral. As I got out of the car, I felt as though I was treading on sacred ground. Maybe that's a little extreme, but after nearly forty years of memorizing his paintings of this place, not too far off the bat. Christina's World, on display at the MOMA, is the most famous painting set in this location, but my favorite is Weather Side. The weather was perfect that day, so Karen and I did a lot of photography. We probably spent the better part of two hours going over every square inch of the house, inside and out. Each room evoked a memory. It was as though I had returned to a house where I once lived. A very strange, yet wonderful feeling. I used to live in Pennsylvania and Massachusetts, and I have a lot of happy memories of both. I think that's one reason Wyeth's paintings are so powerful for me, since most of them are representative of Pennsylvania and New England. When we felt we had extracted all we could from the house, Karen and I went down to the Olson family graveyard. 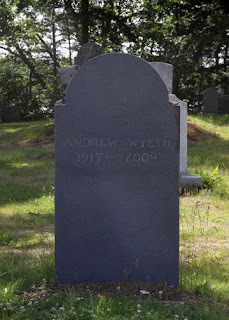 We were surprised to discover that Andrew Wyeth was buried there near Christina and Alvaro. The family cemetery is located in a wooded area on the bay a short walk from the house. You can just see the water through the trees. A beautiful, and very peaceful spot of land. I left there fulfilled, ready to move into our digs for the night, and get something to eat. 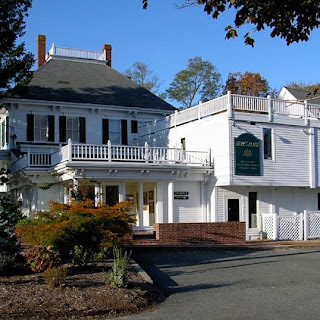 It was a short drive from Cushing to Camden, and our lodgings at the Whitehall Inn. The inn was originally a sea captain's home, but was purchased in 1901, and was gradually transformed into an inn. We had a wonderful room on the top floor with a view of the water. After unpacking, we drove into the town center, and had dinner on the dock. A perfect end to a perfect day. Early the next morning we went down to the water a couple of blocks from the inn, and watched the sunrise. After that we returned to the Whitehall for breakfast. Fueled and ready to go, we drove into Rockland to visit the Farnsworth Museum. They actually own the Olson House, and operate two other facilities as well. The Farnsworth Museun and the Wyeth Center. 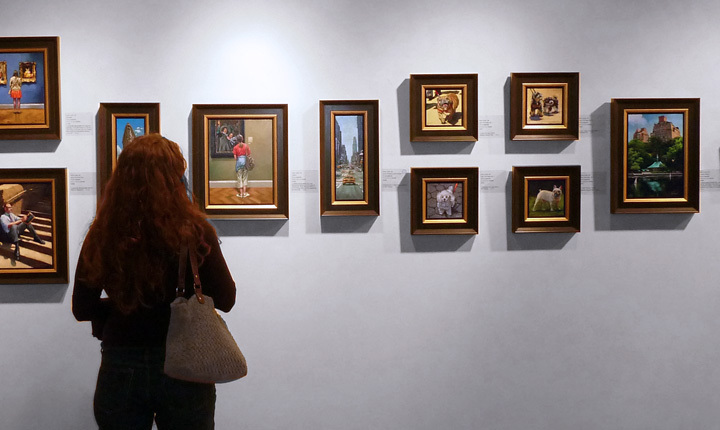 The Wyeth Center was having a special exhibition of paintings and drawings, most of them on loan from the Marunuma Art Park collection in Asaka, Japan. 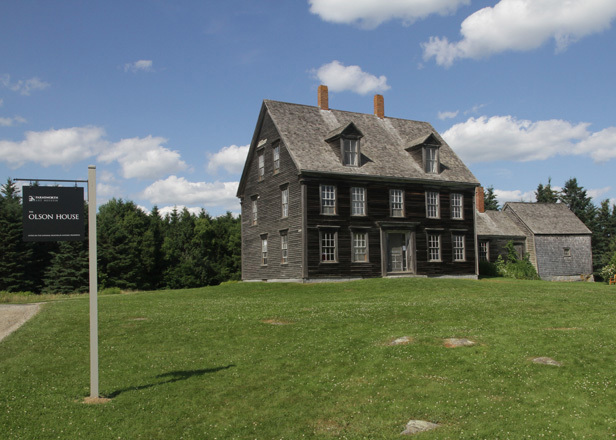 The exhibition is titled: Andrew Wyeth, Christina's World & the Olson House. A terrific compliment to our visit there the day before. Once we'd finished up there, we plugged in a book on tape, and began the drive into Orleans, on Cape Cod. Our plan was to get to the gallery before closing on Friday, but we spent more time in Rockland than expected, and had vastly underestimated the traffic heading out of Boston to the Cape on a Friday. Vastly underestimated! 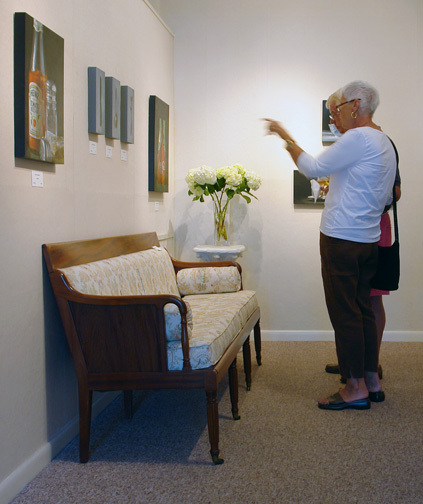 So we called Julie Bangert, the director of Tree's Place Gallery, and let her know that we wouldn't be in until well after closing, and we'd see her in the morning. That evening we checked into our motel, then ran out long enough for some Thai food before we came "home" and crashed. The gallery didn't open until 10, so we went out early to the beach, and after a short walk, tracked down a spot in town for a late breakfast. 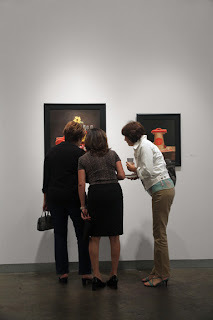 We lingered with out coffee until it was nearly 10, then headed to the gallery. The space looked beautiful. Julie, Katrina Hayes and Kelsey Whitaker (sorry about the blurry picture), had done a wonderful job of hanging the paintings, and staging the gallery. We walked into the gallery right at 5, and the parking lot was already nearly full. When I saw those cars I breathed a huge sigh of relief, "people did show up! ", I thought to myself. Julie, Katrina and Kelsey were all very upbeat, and excited about the show, and it wasn't long until visitors began to come up, and compliment me on the work. One of the first guests to approach me was Steve Zafarana and his wife Sue. 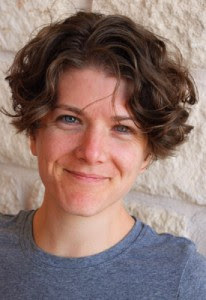 They are type designers, and are part of a group called BluHead Studio, LLC. I liked them immediately. We had a great time discussing our years in graphic design. At one point in our conversation I happened to mention that I used to live in Norwood MA, then very quickly, and in unison they both said, "we live in Norwood!". Steve and Sue, if you read this, thank you for coming in to see the show. It was wonderful meeting you both. Teresa Fischer and I taking art. A little later I felt a hand on my shoulder, and as I turned I was greeted by Teresa Fischer. Teresa is one of my favorite artists, and her husband Scott is an awesome illustrator. I was shocked to find out that Teresa had driven three hours to get to the gallery. She was so nice, Karen and I fell in love with her immediately. After talking with her for five minutes, it felt as though we had known her for years. My one regret was that I didn't have near enough time to visit with her. When your the one having the show, you spend a lot of time talking with a lot of different people, and not enough time with any of them. Thank you again Teresa for coming, it was really great to meet you. My entire evening was spent talking with wonderful people, all very complimentary of my work. I had a fantastic time to say the least. On a commercial note, combining pre-show sales, with paintings sold during the show, I had, by the time the doors closed, sold five paintings. There is also talk of a number of commissions, so I am calling this a successful show. Thank you again Julie, and to your staff, for the positive energy, and hard work you all put into preparing this show. I was overwhelmed by your generosity, and kindness. That night after the show Julie took us into Wellfleet to a have dinner at a wonderful restaurant called the Wicked Oyster. Before we ate Julie drove us around Wellfleet, a delightful town on the Cape, filled with shops, restaurants and galleries. Our dinner was delicious, and it was really nice getting to know Julie, who is lovely in all its' definitions, a little better. A great capper to a great day. Our plans for Sunday changed entirely when I made a significant error in my planning to visit Nantucket for the day. I got some times completely wrong, and we missed the ferry. Karen was great about it, and said she'd just as soon go back to Provincetown, so we did. 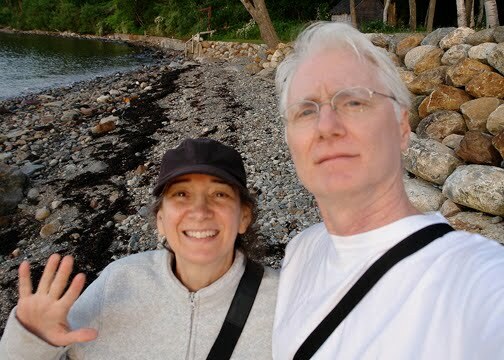 We had a much more leisurely visit than the day before, and got to see some places we'd missed on Saturday, like the Provincetown Museum of Art, and the beach. I was really excited about coming back because I had had only one bite of Karen's sandwich from Karoo Kafe the day before, and couldn't get that flavor out of my mind. I wanted one of my own, so we ate there for lunch, then on the way out, stopped in again to pick up two more sandwiches for dinner that night, back in our room. Monday we left early for the airport even though our plane didn't leave until noon. I'm glad we did because we hit that horrific Boston traffic once more on the way in. The flight was on time, smooth, and on the drive home we missed Atlanta rush hour traffic. All and all it was a splendid trip.